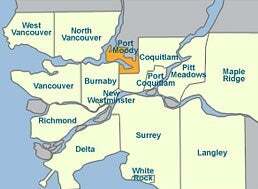 Port Moody is located at the head of Burrard Inlet and at the foot of Eagle Mountain. A vibrant city of 34,000, Port Moody is located an easy 40 minute drive from both downtown Vancouver and the US border, and just steps from seaside parks, mountain trails and lakes. See the Neighbourhoods section to learn more about Port Moody.